Abansys Review 2019: Is Abansys a Good Hosting? Established in 2001, Abansys is a small Spain-based web hosting provider that serves Spanish speaking populations in Spain, Mexico, the United States, Korea, and Malaysia. While well-priced for a European market, their hosting solutions are unexpectedly expensive for a Spanish market. Abansys is a web hosting company that began their operations in 2001. Over the years, this Spain-based hosting vendor has maintained a consistent trajectory of steady growth, though they’re still a relatively small vendor compared to others in the Spanish web hosting space. This hosting provider serves individuals and businesses in Spain, Mexico, the United States, Korea, and Malaysia. Their website is only available in Spanish. In the last few years, Abansys has been continually reinforcing their hosting infrastructure. They now sport a predominantly cloud-based network of servers, offering both Linux and Windows shared cloud hosting as well as elastic cloud servers to their customer base. Rotation of logs – Abansys has a protocol that eliminates the problem caused by applications that keep generating large log files and thus occupy valuable space on storage servers. These log files also often make it very difficult to read the content of these servers. The Abansys protocol partially stores the content of these log files in an organized, clutter-free process that ensures no unnecessary logs occupy your disk space. Web statistics – Abansys uses advanced real-time web metrics that help you track website visits so that you can better understand your customers’ interests and the actions they take on your website. What’s more, this feature includes the ability to check in real time the results of any advertising campaigns you have developed. Protected directories – Given the growing number of hacking incidents and data breaches, it’s reassuring to see that Abansys includes protected directories that can only be accessed by certain individuals. These password protected directories host all files to which you wish to limit access. Abansys does not appear to have any uptime guarantees or SLAs, although my quick tests yielded an average uptime of 99.98% for the last 90 days. Compared to other vendors based in Spain, Abansys’s hosting solutions are surprisingly expensive. They’re not bad by European standards, but given the many other higher-quality hosting vendors around, I can’t see how Abansys can justify charging higher rates. What’s more, a considerable number of people who have used their services have very few positive things to say about the company and their solutions. Abansys offers no money back guarantees or free trials of their services, unfortunately. Furthermore, Abansys’s technical support was a huge disappointment. In addition to not having a ticketing system or an email through which customers can contact their support staff, Abansys has added several inactive support links on their website. The company has no live chat support and the links to their social media profiles are also inactive. Though the company claims to have 24/7 customer support and an average response time of 15 minutes for all their tickets, their ticketing system is either entirely non-existent or so buried in their website that it’s of little use to their customers. 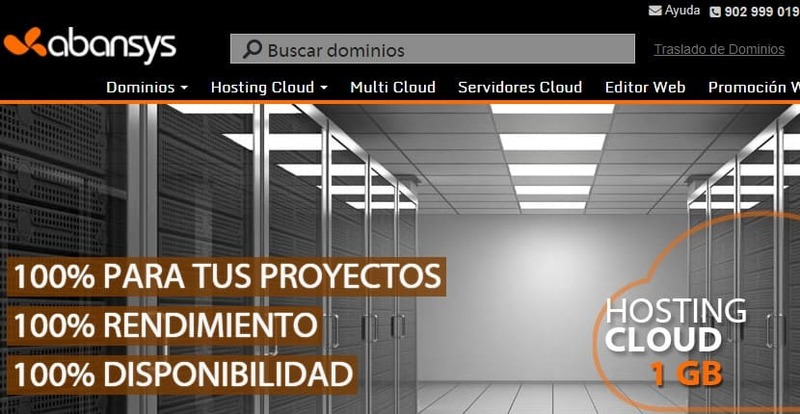 Abansys makes many unsubstantiated claims of their dominance in the Spanish web hosting space, including the assertion that they’re one of the top five providers of hosting and domain registration services in the country. A closer look reveals a company that doesn’t do enough to provide necessary information as well as quality support to their customers. Anyone who intends to subscribe to their hosting solutions must therefore proceed with utmost caution. Wondering how Abansys stacks up against other Web Hosting companies? Enter any other Web Hosting company and we will give you a side-by-side comparison.